Sebastian and I survived the trip to the Vino Volo wine bar in the terminal and made our way to the gate. We soon boarded and all was proceeding swimmingly. 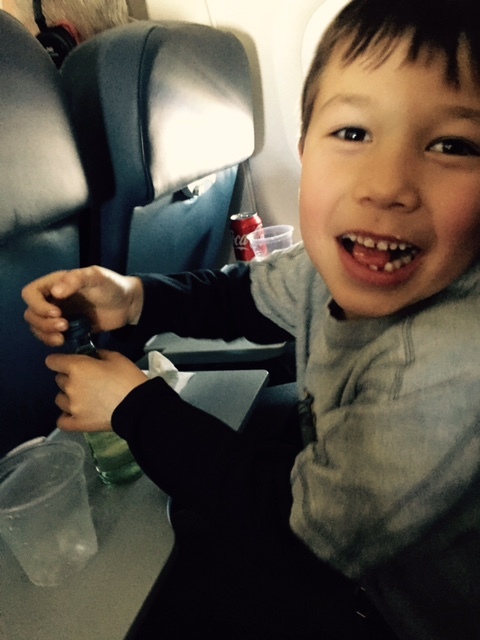 Soon after we were in the air, Sebastian stated that he was bored. He said it again, this time accentuating his pronouncement with a slight punch to my arm so that I would have no choice but to respond. I suggested that he do a few activities in his new Yes & Know Mr. Mystery Secret Agent Spy – Invisible Ink Game Book that I so wisely purchased before the flight in order to keep him at least remotely occupied during the flight. He opened the book just as I opened my laptop to get to some writing. Moments later, after flipping through a dozen or so pages of the book, Sebastian gave up and asked if he could watch something on the iPad. Not deterred, I was determined to make my $5 investment in the Yes & Know book pay off. I snatched the book out of his hands and perused the activities. They were a bit challenging, to say the least; I was not sure if I could go through the book with a “perfect” score. Determined to get some work done myself, and even though it went against my paternal instincts, I broke out the iPad onto which my lovely wife had downloaded a few movies for the lad to watch. After several minutes of searching, he had already seen all the movies that were on the tablet, and had little interest in watching any of them again. Just then, however, the flight attendants came by to offer beverages and an in-flight “meal” (how they get away with calling what they sell “meals” is beyond me). I knew there is nothing that can distract my little guy better than food, so we looked through the “menu” (do two choices for a “meal” actually constitute a “menu”?). He was not interested in either–I should have omitted the fact that the sandwich contained lettuce, which is pretty much Sebastian’s kryptonite. He eventually agreed to have the cheese and crackers as long as he did not have to eat the cheese (it was at this point that I sincerely began to question my paternity) and I acquiesced. After this episode, it was clear that I needed some wine and was deciding between the two Wagner Family bottlings offered on the flight, the Conundrum (a white blend) and the Meiomi Pinot Noir. Battered from my run-in with the six-year old and wondering what the next five hours would bring, I stammered and stuttered trying to explain my choice (the Conundrum) to the flight attendant. After minimal efforts on my part, she abruptly cut me off and said it didn’t matter, I just needed to pay her and then tell the other attendant on the following cart, whether I wanted the red or the white (two choices, yet again–I was seeing a pattern–was limiting the choices to two meant to simplify ordering for the passenger or the crew? Hmmmmm.). The other attendant laughed when I told her about my transaction. Apparently the second attendant had told the first to put the Conundrum on the cart but the first refused since “no one ever buys it.” So, she said, I would need to wait until she could go get a bottle. She returned a few minutes later and informed me that the first attendant only charged me for the “regular” wine. I shrugged and said OK. I figured it would be some God-awful critter wine but it was only five o’clock. I figured I would have the mini-critter and then get the Conundrum when it was time to eat. When she returned with the wine it was far worse than I feared. It was not a mini bottle of critter wine. Apparently she felt sorry for the confusion. Or she wanted to kill me. The second time around (a good two hours later) I did not make the same mistake, I rehearsed my words, I spoke with a clear, unambiguous voice: I asked for a half bottle of Meiomi (although I still have no idea how to pronounce it). Moments later, I received my reward, complete with plastic cup. I know there are those out there that are not all that enamored with this Pinot, but at 35k feet, the choices are limited. $16 for the 375ml is not too bad, and if you pay with a U.S. Airways MasterCard issued by Barclaycard, you get a friendly 25% off (no, this is not a paid advertisement for the wine, the credit card, or for American/US Airways). That brings it down to pretty close to retail. Who says the airlines don’t care about the passengers? 2012 Meiomi Pinot Noir: Retail ~$20. Darker than I expected and certainly rich in the plastic cup with plum and black-cherry Kool-Aid predominant. This is not a delicate, terroir driven Pinot by any means, but after the iPad debacle, I know I was faced with at least 6 games of hangman, 3 games of war, and countless grids of tic-tac-toe over the next several hours. At this point, shoe polish with a rubbing alcohol chaser would have been appealing. Good to Very Good. 86-88 Points. I chose not to write a tasting note for the Barefoot Chardonnay, although I may have detected a slight hint of arsenic…. Sebastian insisted on opening the bottles and pouring them for me, which was simultaneously endearing and disturbing. This entry was posted in Chardonnay, Humor, Pinot Noir, Travel, Wine. Bookmark the permalink. Have you seen this? 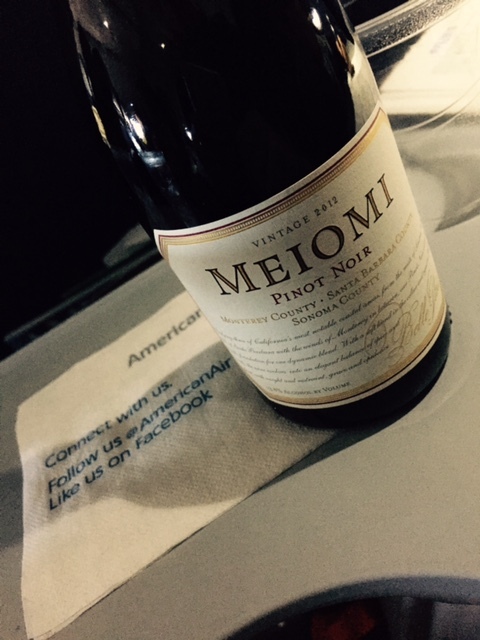 It’s about improving wine on a plane… your experience made me think of this. Ha! I had not seen that–thanks for sharing it! I will certainly try it out on the way home! As someone who just flew first class to and from Cancun ( thanks to Mike’s business travel) the wine there is not any better! I only had a choice of red or white. That is certainly disappointing to hear! I have only flown business class twice but both times it was on Air France. To say the wine was good is an understatement (Premier Cru White Burgundy good). You drank wine on a plane? Domestic flight? You’re a brave man. Tell me about it. I yearn for the good old days when you could bring liquids on to the plane…. Thanks so much Dina! To you and yours as well! Very entertaining! and endearing! On another note, might you make a long distance suggestion on reds that would pair nicely with a game of Texas Hold’em poker here at my abode? I remortgaged the house to buy-in to this game (I’m kidding) so an inexpensive wine would be great. I like ’em big and bold. On second thought, might you also suggest a smooth, not too mouth-puckering white as well? I’m not as well versed in whites as I am in my reds. I’ll make notes and report back on my findings! and hopefully my winnings! Cheers to you and your family! From reading your blog, I assume you are up in Canada, no? I am not all that familiar with what is available to you, but on the inexpensive side, I would opt for an old-vine Zinfandel from Cline Cellars. They are a big producer so likely you can find some. As for the white, grab a Verdejo from Spain or Vinho Verde from Portugal. Both will have options on the lower end of the price spectrum and both have enough acidity to make you worry about your tooth enamel (and the Vinho Verde has a slight sparkle to boot!). Good luck with your game–remember: try not to go all in before the flop, that’s for suckers…. Thanks so much! I live in Toronto, Ontario, Canada. No worries about me doing that before the flop. Patience is the key! Plus a few other tricks don’t hurt. I’ll try and find those and give them a go. Cheers! The problem is he turns down all cheese–even the good stuff! I think he and I agree, there is no good cheese! Bravo to The Little Guy for turning down the cheeze. Little Squirt. Phew! OK, I can still marry you in another life…. Barefoot wine is good if you’re in a pinch, haha. A pinch? Does that mean alone on a deserted island with no hope of rescue, dying of thirst, with absolutely nothing else to drink to stay alive kind of pinch? Haha! Sebastian is such a cutie! Happy Easter! You were a very brave man enduring that flight with no entertainment for the kiddo. I hope y’all had a Happy Easter! Thanks so much—the boys had a great time! Having just traveled with a 5 year old I can totally relate to this experience. Very much agree with your notes on the Pinot Noir, surprisingly big for a pinot. Thanks for the comment Jeff! Yeah, traveling with the little guy solo is fun. Until you try and get something done…. You have made me second-guess reproducing. 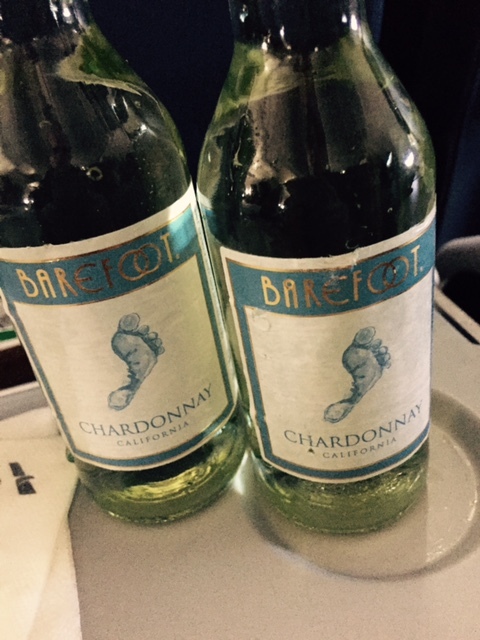 Also, good call on the Barefoot Chardonnay. Gaaaaaross! Ha! While there are moments of panic, I never second-guess the decision to have my two little knuckleheads. Parenting is not for everyone, but I would not trade it for anything. Well, except a life-long supply of Krug….